Audi is promoting the new flagship sedan, the Audi A8, in “Goodnight”, a commercial inspired by the Margaret Wise Brown’s 1947 children’s story “Goodnight Moon”. The 60-second spot takes the viewer on a fantastical journey through a mansion laden with trite symbols of antiquated, stuffy opulence, and says goodnight to the age of gluttony and old luxury, culminating in a Mercedes-Benz S-Class parked in the driveway. In contrast, it offers up the all-new 2011 Audi A8 flagship sedan, the most technologically advanced vehicle the company has ever produced. “Goodnight” was developed at Venables Bell & Partners, San Francisco, by executive creative directors Paul Venables and Will McGinness, creative director/art director Erich Pfeifer, creative Crockett Jeffers, agency producer Mandi Holdorf and director of integrated production Craig Allen. Filming was shot by director Daniel Kleinman via Rattling Stick, London, with producer Johnnie Frankel and director of photography Alwin Kuchler. Post production was done at Framestore. Framestore’s main challenge was to create one seamless camera move from multiple shots, including projections in Flame. 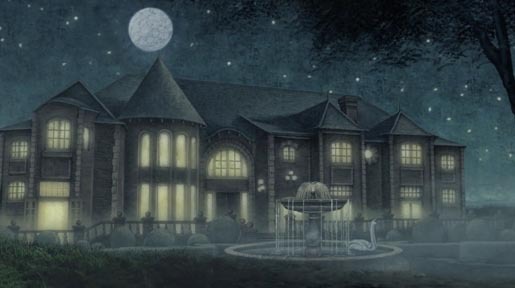 The VFX team, led by William Bartlett, also had to develop a transition from the spot’s opening illustration and create stylised smoke whilst compositing CG elements such as the mouse and the rider under the lamp. Bartlett VFX supervised the shoot, creating a pre-vis on set in Nuke. He took detailed measurements of the location and calculated camera parameters to ensure the footage was filmed correctly. The production required 10 weeks of CG and four weeks in 2D. Editor was Steve Gandolfi at Cut + Run. Colorist was Stefan Sonnenfeld at Company 3. Music was produced at Elias Arts. Sound was designed at 740 Sound Design.